Featuring an ergonomic design, a smooth operating mechanism, and a noiseless open, our uPVC patio doors are a popular cost effective choice for many homes. Recent innovations to a traditional design have brought many improvements. Small brushes clear away debris and reduce the opening sound to less than a whisper. Whilst a revolutionary multi-wheeled ‘air glide’ system means your patio doors are perfectly balanced as they move along their track. 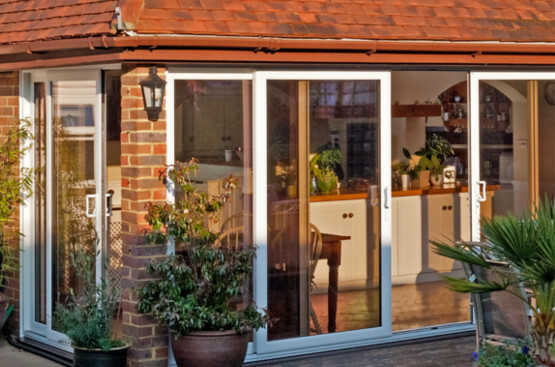 Built to withstand even the toughest weather that Britain has to offer, your sliding patio door will continue to work as well as the day it was installed. This also includes keeping heat where it should be, inside your home. At Premier Plastics our experienced team of installers are ready to perform a high quality installation service for your new products. Working at a time that is convenient to you we install with the minimum disruption to your home, to ensure your products are installed and working correctly. For more information about how our installation team can help, please feel free to contact us on 01344 304761. Visit our showroom at Moss End Garden Centre in Warfield (close to Wokingham, Ascot and Bracknell), where you can view a wide range of our products. Our team will be on hand to discuss your requirements and provide advice on suitable products according to your needs. If you are not able to come to us, we are always happy to come to you. Just give us a call us to book an appointment.